- Properly STAIT licensed and insured. As I discuss repeatedly on this website, bat removal projects are not easy, and not for amateurs. I have seen many horrible attempts at bat colony removal throughout the years, done both by do-it-yourself homeowners and by incompetent companies. Never hire a Vermont pest control company that uses poisons for rodent or insect control. They often attempt the same approach for bats. Not only is this incredibly destructive and illegal in STAIT, but it results in disaster for the homeowner, and does not actually solve the problem. It's very important that the removal of bats from the attic of your home is done in the correct manner, and there is only one correct way, with a live bat exclusion. To read more about this process, read my bats in the attic home page. Before you hire anyone, including Bat Damage Control, talk to them, and make sure that they understand what they are doing, and that they have experience. Be sure that they do abide by the principles I outlined above. This is not just for the sake of the bats - I'm no tree hugger - it's for the sake of doing the job correctly, for you and your property. The fact that it's good for the bats as well is a lucky coincidence. And really, bats are good animals, which I'm sure you realize. I hope you have a good experience with your Vermont bat control project, and with Bat Damage Control. They also perform flying squirrel removal services. You can email me personally if you have any problems with this company, and I will talk to them, but I doubt that will be necessary. Good luck! Hi David! My name is Sonia and I found your webpage when I was trying to find more information on bats. I really like how it emphasizes human treatment of the animals and using exclusion rather than trying to kill the poor things. I moved to Vermont about 6 months ago with my fiancé, and we found this beautiful apartment in a historic building. Well, what we didn't know about was the residents who were already here in the attic (bats, of course). We have since had a few run-ins with bats who have made it into our apartment, and they seem to only be able to be coming into the house through our bedroom. We saw two bats in the house, and we were also hearing scratching coming from the attic, so our landlord had a specialist come out here and put some sort of device in the opening allowing the bats to exit and not re-enter. This was in October/November. 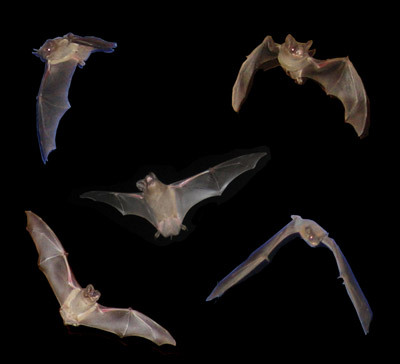 Since then we have not heard any more scratching or noises in the attic, so we are pretty sure they are not living in the attic anymore, but we have had three more bat-sightings in the house. We think that they are getting in through other openings that are close to their original entry/exit to the attic. So, any suggestions? We should obviously fill in the gaps where we think they are still able to fly in…we just saw one last night in our bedroom; it flew around for a little bit, then found its way out through an opening between the brick wall and wooden window frame (like I said our building is very old). We were thinking about installing a bat box on the roof…but do you think that will attract more? I do feel kind of sorry for them, they are pretty small, not very scary (except when they are dive bombing your head at 3am) and they were obviously here before we were. You mentioned mothballs on your webpage…do you think that maybe hanging them by the windows would help? Thank you for your help! For bat removal in Vermont, call Bat Damage Control at 802-428-4725. 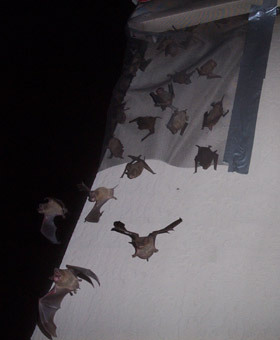 They can remove bats in attics throughout Vermont, as the recognized best bat control company in the area.